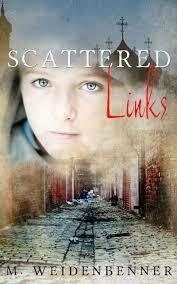 Scattered Links, by local author Michelle Weidenbenner, is a book about a teenage girl named Oksana from Kazak, Russia. She lives with her mom and aunt Ludmila. They are very poor and must steal to survive. Oksana’s mother has a baby and names her Natalia. Ludmila thinks they can’t all survive together so she takes Oksana and Natalia to an orphanage and never sees them again. Some months later Natalia is about to be adopted by an American family by the name of Jack and Katie Engle. She doesn’t want them to take her because it’s her last connection to her mother. But later she gets adopted by them and moves to America. She doesn’t like it until she goes to a ranch with Katie and meets an injured horse who she names Boris. She didn’t think she could ever trust again until she met the horse. I liked the book Scattered Links because it’s very emotional and exciting too. It was interesting to see how Oksana deals with being left alone without a mother. I enjoyed how she made an emotional bond with the horse Boris. I highly recommend this book.